Don’t Take Crapes for Granted! Unfortunately, many people do take crapemyrtles for taken for granted in our area. Personally, I love crapemyrtles because they are always at their peak just in time for my birthday on July 18. But for some people, we see them so often that they almost blend into the background. Some people say they are over-used. If so, it’s for good reason. They are spectacular! 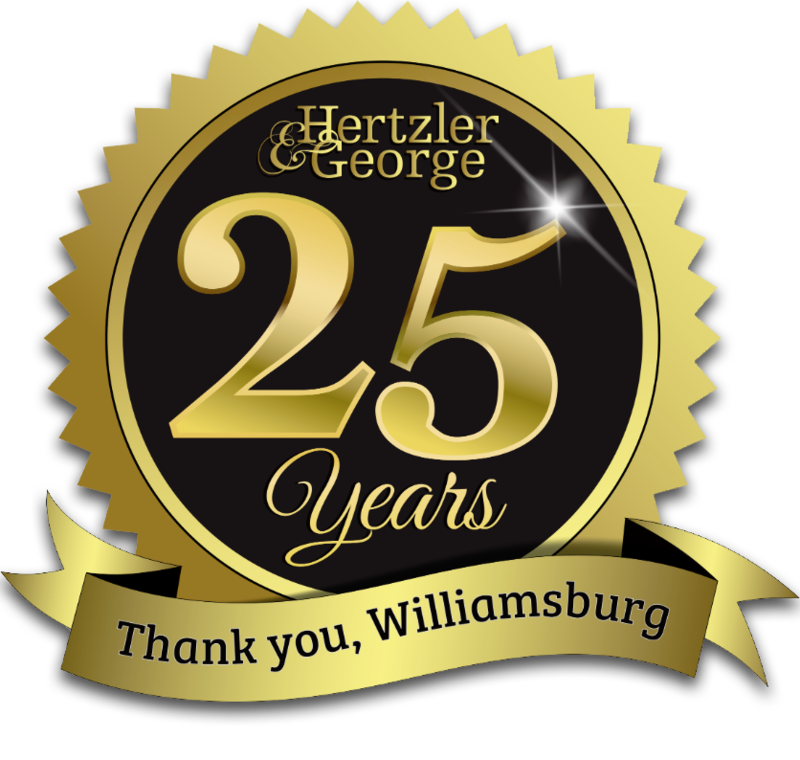 It’s always refreshing to me when I meet someone visiting Williamsburg in the summer for the first time. They stare, eyes popping, and waste an entire roll of film shooting pictures trying to capture their amazing flowers. Take a look at the slideshow above to see our attempts. Spring – Crapemyrtles are one of the last trees in our area to leaf out in the spring. When everything around them is in leaf, the crape’s bare branches add an interesting final echo of winter. When they do leaf out, the foliage is a nice light green. Summer – Summer in Virginia would not be the same without this remarkable tree. “100 days of bloom” is their claim to fame, and the bloom is certainly what catches one’s attention. But there are other reasons why this plant is great in summer: it is incredibly drought tolerant, so much so that it is often used as a parking lot tree, and there are very few disease and pest problems to deal with. Fall – Crapes have an incredible display of fall color. They turn from yellow to orange to red. Winter – The “bones” of this tree is one of its greatest features. As a garden designer, I look for plants that have interesting architecture (the underlying form of their trunk and branches). Here again, crapes do not disappoint. Their trunks and main branches ripple like lean muscle. And they have a wonderful variety of bark colors ranging from blonde to rust red, forming an attractive silhouette against the winter sky. Some even have peeling bark for extra textural interest. 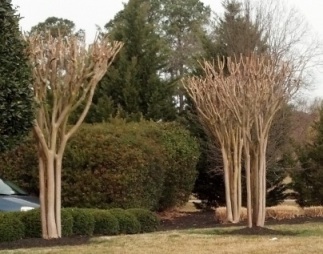 However, any discussion of crapemyrtles would not be complete without mentioning the unfortunate practice of topping crapes in late winter, often called “Crape Murder.” This is when crape limbs are cut back to short ugly stumps on the main trunk, without regard for the tree’s natural shape. Many people perform this ritual every year believing it is the proper way to get the trees to bloom. 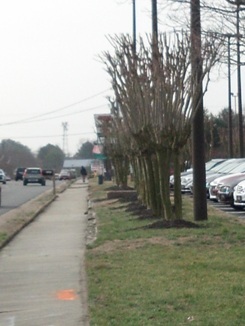 While this may have been necessary many, many years ago, today’s hybridized crapemyrtles no longer need it. They’ll bloom profusely all on their own. And while it doesn’t hurt the plant, it sure does ruin their fabulous branching pattern.